Indian Motorcycle announced it will again serve as the title sponsor of the 2019 Flood Run on Saturday, April 20, 2019. 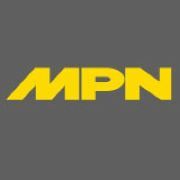 Thousands of motorcyclists will hit the road for a ride along the Mississippi River in support of Gillette Children’s Specialty Healthcare. The Flood Run has been a biannual tradition which has supported great causes since 1965. The day’s events begin at 8 a.m. with breakfast and activities at Beach Bar and Grill in Lake St Croix Beach, Minnesota, including featured guest Cameron “Cam,” a dynamic patient of Gillette Children’s Specialty Healthcare. Cam’s artwork will be showcased on t-shirts available for purchase at the Beach Bar and other locations along the route. Riders depart at 10:30 a.m. The entire route covers 218 miles along the Mississippi River in both Minnesota and Wisconsin. A ride within the run, called the Gold Star Run, gives those riders who pay to complete the entire ride a special pin to recognize their accomplishment. Those not looking to complete the entire run have the ability to cross the river at other locations to form a shorter loop. 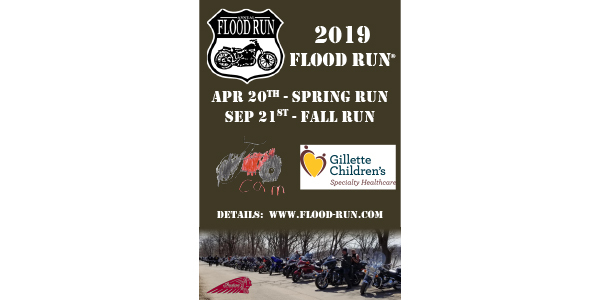 Official Flood Run booths are located at the Beach Bar and Grill in Lake St. Croix Beach, MN; the Nauti Hawg in Diamond Bluff, WI; Maiden Rock, WI; and Buck’s Bar and Grill in Minneiska, MN. Riders may pick up their wristbands or Flood Run collectables at any of these booths. Gold Star cards are sold at the Beach Bar. Additionally, IARG, a motorcycle group for the Twin Cities area, will be hosting a raffle in conjunction with the Flood Run to benefit Operation: 23 to Zero, a non-profit which works to prevent veteran and military suicide. The prize is a 2019 Indian Scout donated by Indian Motorcycle. Tickets are $20 and can be purchased at several locations along the run with the drawings to be held at the evening celebration at the Beach Bar and Grill starting at 7 p.m.